SmithAmundsen proudly embraces the diverse perspectives and experiences of different ethnic, religious, racial, gender and socioeconomic groups that exist within the legal profession. To that end, our Diversity Committee was pleased to host an event in honor of Hispanic Heritage Month. 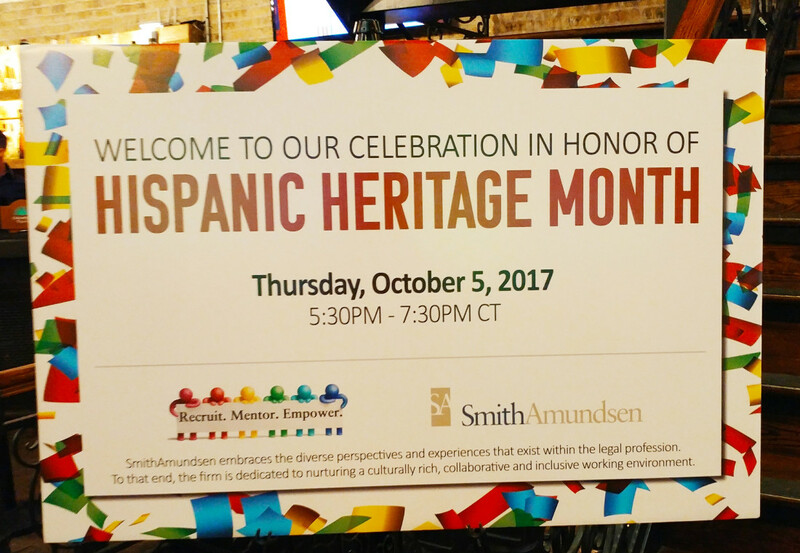 On October 5, 2017, clients, friends joined SmithAmundsen’s attorneys and staff for food, drinks, and networking at Moe’s Cantina in Chicago in celebration of Hispanic Heritage Month. The event featured a speech from special guest of honor, Judge Jesse Reyes, Appellate First District Court, 5th Division. Our Hispanic Heritage Month event served as not only as a celebration of heritage and culture, but to recognize the important presence of Hispanic and Latino Americans, and their contributions to our country, our community, and SmithAmundsen. Visit our Facebook page to view pictures from the event!